Vascular dementia is a common type of dementia, but can affect patients in different ways, according to the Alzheimer's Society. But, problems with planning or organising, making decisions or solving problems could be an early indication of the condition, it said. Symptoms of the condition can either develop very quickly, or over a longer period of time. Other early signs of vascular dementia include behavioural changes, difficulty concentrating, and trouble with understanding. "Vascular dementia will generally get worse, although the speed and pattern of this decline vary," said the Alzheimer's Society. "The most common cognitive symptoms in the early stages of vascular dementia are problems with planning or organising, making decisions or solving problems, difficulties following a series of steps (e.g. cooking a meal), slower speed of thought, and problems concentrating, including short periods of sudden confusion." Mild memory loss could also be a sign of early vascular dementia, while some patients experience difficulty perceiving objects in three dimensions. It's also common for patients to develop depression or anxiety, the charity said. Vascular dementia is caused by diseased blood vessels. The brain doesn't receive as much blood, and therefore doesn't get all of the oxygen and nutrients it needs. The risk of developing vascular dementia doubles every five years, when over the age of 65. Less than 8,000 people in the UK aged under 65 and have vascular dementia. But, you're more likely to develop the condition if you've had a stroke, or if you have diabetes or heart disease. 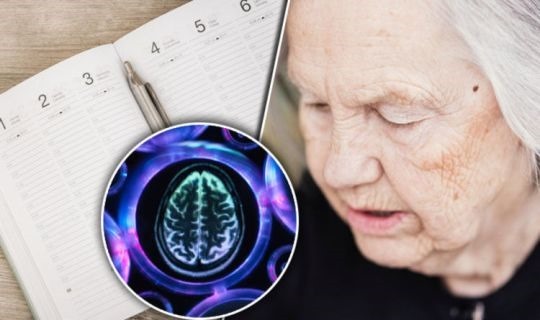 There's currently no cure for vascular dementia, but making small lifestyle changes could slow down the condition's development, the NHS said. Following a low-salt diet could treat the underlying cause of the dementia, if it's caused by high blood pressure. Other lifestyle changes include losing weight, stopping smoking, and cutting down on alcohol.